Tuesday night, the kids participated in the MCJROTC ceremony and it was the coldest night of the year so far! I could see poor Kelly shivering from across the field! But they insisted the cake afterwards was worth it! The boys have decided they like this program as much as Kelly does, so it's been a great decision for all of them. Yesterday, Bill and the boys ran a local 5K to support the human society and Kelly volunteered at the race to earn points for her Beta Club participation. I stayed snug and warm in bed, but they all had a wonderful time from what I hear. Danny and Bill both placed first in their age groups, and Danny placed 2nd overall. David placed second in his age group right behind his brother. Kelly and I spent some time at the barn last night with friends around the bonfire. Luckily the fire kept us warm and the friends kept us laughing! Hope your week was wonderful as well! Raising three teens is not a simple task. Don't get me wrong, I totally love every minute of it...well, except the part about how messy their rooms are. But you may have noticed a post or two appear here over the past few months, only to have it disappear again. Seems, I have a few extra editors in the house. I totally want to respect their privacy but sometimes, what I think is okay to share, is not what they think is okay to share. But I've had some comments from folks who were regular readers saying they miss this little window into our adventures. This summer was filled with fun and challenges. We spent lots of time relaxing and playing but we also spent (mostly me) lots of time travelling to and from NC because Mimi had back surgery. She is recovering well now, but it was quite the rocky road for a bit, and I know she's glad to be on the other side of that! Back to school, meant all three kiddos went to HIGH SCHOOL. What??? How can that be? Didn't I just have these babies? Never the less, they all were happy to see their friends and have a regular social structure again. Oh, and the classes are going okay too. Two out of three have straight A's and the other only has a few B's. Honestly, I wish I could have said the same for myself at that age! Kelly is still riding at the barn and enjoying her work there once a week. I think she could live at that place and be just fine! She is also now 16, and we had a huge party to prove it! She invited about 20 of her closest friends over for a campfire/swim/cookout party. It was so much fun, and it was good to see how funny and silly a bunch of really cool teenagers can be. It's even better to know that she has recovered fully from her surgery last year and is back to all her regular activities. The boys started cross country and were at the school at 6am every day this summer to train. (Not my favorite taxi duty!) But all the hard work paid off and they have had a wonderful season running with the team and enjoying the friends they have made. They have even competed in a few community 10K and 5K races. Bill is still flying a 767 at Delta and is almost always on call. At any moment he could leave for Europe, or Orlando or New York. It's not been too bad, and he has been able to stay mostly stateside, which is easier on the time zone body clock. He has been running with the boys and proudly displays the photo of Danny and him crossing the finish at the Peachtree Road Race. Meanwhile, my little business Butterfly Threads Quilting is keeping me super busy. 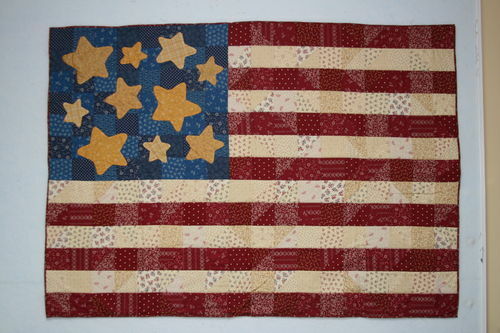 I've had a dozen quilts either published in magazines, books, or calendars. Some are still in process, so there is much packing and shipping of boxes back and forth. I've been very pleased with my steady trickle of business at my ETSY store and my calendar is booking quickly with teaching and workshops! I have teaching contracts lined up for January through June and am so excited to be sharing my love of quilting with so many eager quilters! It is truly rewarding, even if it is exhausting. Luna continues to entertain us on a daily basis. She is so sweet and sassy and entirely too rude to the dogs. They still think she might play with them, and are sadly disappointed by indignant hisses each time they try. It's really kind of pitiful. But they get lots of love and belly rubs from the humans in the house, so they have a really good life in spite of the feline rejection. For now, we are just maintaining the daily crazy that is our schedule, and still managing to sit down to dinner together every night to hear all about who's done what. It may be a bit crazy, but I wouldn't trade these days for anything! Living with three teens is far better than I ever could have imagined, and I know that these days will be gone all too soon. Please know that we are doing well and would love to hear from you in the comments or by email. Why is it only once a year? I think we should have this little event monthly, don't you? Boys really like building stuff. decided they needed to entertain themselves this weekend while Mom was busy at the quilt show and Kelly was busy at the barn. So Bill took them hiking up Sawnee Mountain. We feel so lucky to have this mountain so close to us. It's a great way to spend a few hours outside enjoying whatever season it happens to be. Don't worry, they got haircuts on Monday. As is tradition at our house, each of the kids got sick within a week of returning to school. Our back to school germs this year involved sore throats, congestion, sneezing and headaches. Not fun but managable. Kelly had it worst, missing two days of school. But even she seems to be feeling better now. Whew. I've been busy with the little quilting business I started. Who knew that it would be so time consuming? But I enjoy it and still do a happy dance every time an order comes in. I'm busy writing new patterns for a show I'm doing in less than a month. Bill is finishing up his "vacation" and almost all of his work around the house has been completed. He loves staying home since he travels for work. His days at home are numbered as he goes back on call tomorrow. Sniff. And these two have been spending lots of quality time together. They've had some much cooler weather for riding finally! Maybe something exciting will happen this week so things on this blog can pick up a little. But then again, maybe not, because boring is good. Trust me. Our travel day home began at 9am in Williamsburg when we checked out of the hotel. We stopped for breakfast at Starbucks (thanks Mimi!) then drove to the Richmond airport. Where we watched two full flights leave without us. So we got on a TINY plane to NYC. But we finally got on the last flight of the night! When we got to ATL, Bill was waiting for us at the gate. The kids proceeded to tell him all about our adventure, they talked non-stop all the way home. We didn't pull into our garage until almost 1am. It was a fun filled trip for which we have many wonderful memories, but it always feels good to get home! The kids are still asleep (at noon) because they are resting up for the big night ahead. Once Bill has properly recovered from the race (a nap) we will begin the festivities. We will grill something, make red and blue jello something, hang out with friends, and play with lots of explosives! The arsenal is very impressive this year as we hit the big stores in SC on our last trip through the state. The kids are very excited about that part of the experience. After all, it's not the fourth of July until something explodes! Have fun, be safe, and happy fourth friends! I hope your Mother's Day was everything you had hoped for as well.